Walk-in refrigerators and freezers are generally simple. There are four walls, one of which has a door, a ceiling, a condenser unit and a floor. Inside it’s filled with shelves, and on the shelves can be any variety of food products. The floor is an exceptionally important part of any walk-in set-up. After the door, the floor takes the most abuse on a day-to-day basis. Factoring in foot traffic, cart traffic and weight limits, it’s vital to the performance of the walk-in to select the right type of floor. Below, courtesy of Master-Bilt, is a review of walk-in floor options. Master-Bilt’s standard floor supports 700 pounds per square foot in an evenly distributed stationary load. This floor is good in most cases except where pallet jacks and other heavy carts will be used. It also features a textured .080-inch thick aluminum surface that helps reduce slip-and-fall traffic. This standard floor is also NSF approved. 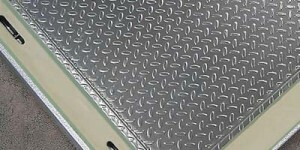 When the load exceeds the standard floor limit, an aluminum or steel diamond treadplate overlay is an option. These plates, available in thicknesses of 1/8″, 3/16″ or 1/4″, are installed with self-tapping screws over the existing floor. Keep in mind that treadplate overlays are subject to acceptance by local codes. For added rigidity and support, pick a heavy-duty floor with a layer of foamed-in-place 3/4″ thick plywood to help distribute the weight of wheeled traffic. These floors offer the most reinforcement and are designed to withstand a pallet jack (or equivalent transporter) with an evenly distributed load of 5000 lbs. over all four wheels. Construction consists of a combination of marine plywood, structural underlayment and a 1/8″ thick diamond tread finish for maximum strength.